Get Clear on Your Vision | Arianna Merritt, M.Ed. How do you handle the fog? Foggy days, like today on the West Coast, always make me reflect on time in my life when my path lacked direction and I couldn’t see the horizon in front of me. Thinking out loud and sharing my “random thoughts” with others really provided light, clarity, and support at a time when I felt hopeless and lost. I have realized that there will always be foggy days in life but with faith and hope for brighter days ahead, you can get through them. Perhaps because today is a foggy grey day and I have also been talking a lot about blogging this week that I feel compelled to write this post and share my thought process with you. The key to creating a successful blog I have learned is to have a vision. 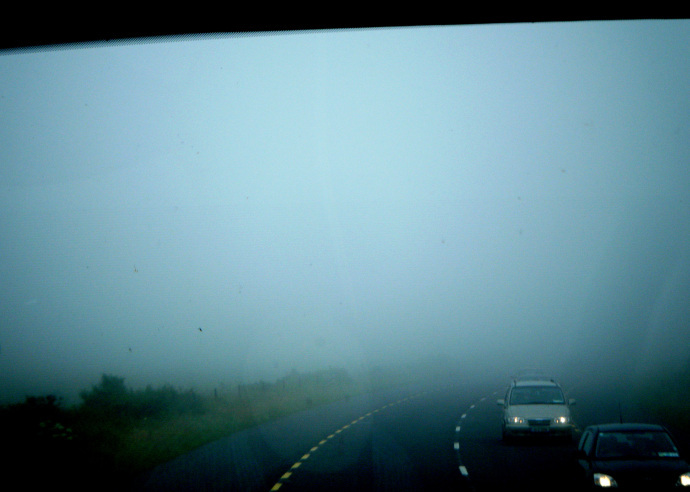 What can really make you feel hopeless and lost (i.e., stuck in the fog) is when you don’t have direction or are unclear about where you are going. Like fog limits your sight, not having a plan means you lack vision. Fog can really limit your sight. Photo Credit: Arianna's Random Thoughts. I started blogging when I was in graduate school because I wanted to share the conversations I was having outside the classroom. Looking back, it was one of the smartest decisions I have ever made as I have grown such a wonderful network but initially it didn’t feel like that. As you may know, Arianna’s Random Thoughts is now a space where people can come and get connected with like-minded souls, receive advice and insight from mentors, and share their stories. However, as the name suggests, the blog started with publishing a post or “random thought” because I had a very general idea. When I started the blog, I didn’t know where my path would lead and had no experience in blogging; I just put one foot in front of the other and started. However, it was lonely at first and isolating – as I didn’t know any other bloggers who were just starting or who I could learn from. My blog also wasn’t attracting as many visitors as I anticipated. One of my favourite parts of blogging is the conversations with others so that part was disappointing for me. Instead of giving up, I decided to become clear on my vision and that made all the difference. It made the process meaningful. Being too general and lacking an overall vision for my blog caused the fog; getting clear and focused about the blog’s vision and what I want to achieve, the fog lifted. Creating something new is a learning curve that takes a lot of hard work, time, trust, perseverance, and a beautiful community. The process requires one step at a time. I thought when I began that reaching out and asking for help was a sign of weakness as I thought you had to know all the answers immediately. Learning the amazing benefit of opening up and connecting with others is what grew this powerful gathering place. Perhaps that is why I have made it my personal mission to empower others to stand tall & speak from the heart – doing so helped me find my way. The fog today caused me to stop and reflect on my blogging journey and how much of an impact it has had in the lives of those I have connected with. I’m so glad I pushed through the fog. Now, I have made it my mission to help guide others through the fog by empowering individuals with the tools and support to turn their dreams into reality. I am creating the support and resources I wish I had when I began. Thank you, foggy day, for reminding me about the importance of being clear with your vision. What do you get excited about? Who do you have a passion for helping? How can you bring light to your path when it is foggy?